Square Quartz and Sterling Silver Cocktail Ring from Peru, "Beautiful Soul"
Possessing a beautiful soul, this cocktail ring from Peru is crowned by a single four-carat stone of natural quartz. Designed by Marianela Vargas, the simple, sophisticated ring frames the stone with high-polish sterling silver in a square shape. Circling the finger with a sterling band, this accessory makes a subtle companion wherever it goes. 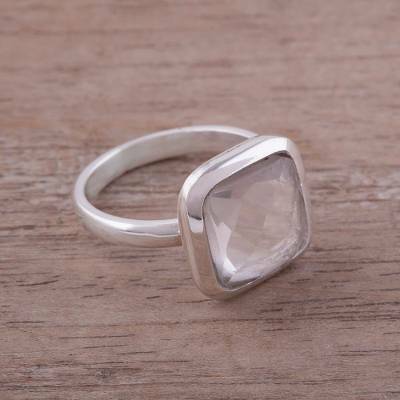 You can find quartz cocktail ring 'Beautiful Soul' by Marianela Vargas in jewelry categories such as Birthstone Rings, Quartz Rings, Silver Rings, Sterling Silver Rings and Cocktail Rings. Enjoy exploring these sections for other Novica treasures.